Yangon is the perfect introduction to this incredible country. Navigate the vibrant streets seeking out keepsakes to take home or watch the golden sunset bounce off the Shwedagon Pagoda, there’s always plenty to appreciate in this hidden gem of a city. 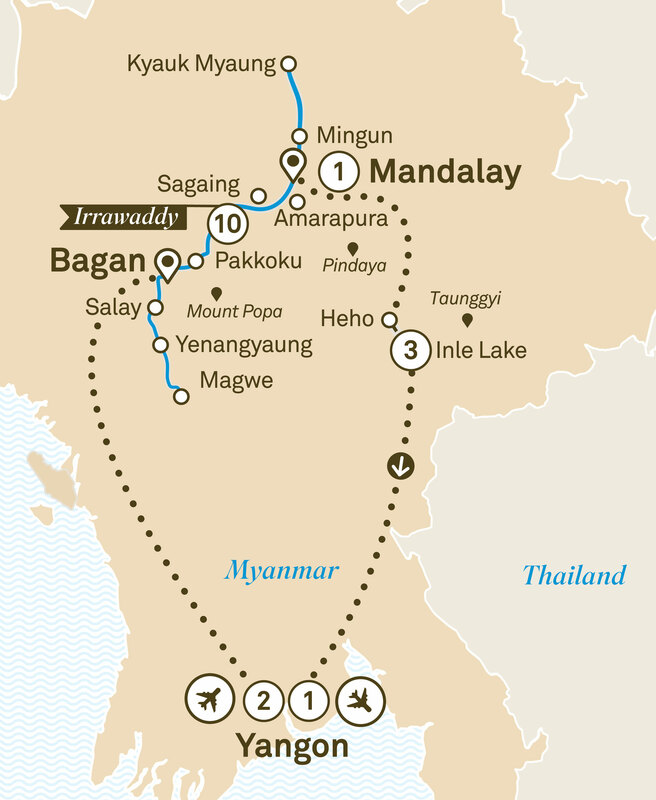 Take to the waters of the Irrawaddy in unprecedented luxury, as you journey from Magwe to Mandalay. Encounter traditional villages, visit the temples of Bagan and marvel at the untold number of pagodas, temples and monasteries. The majestic Inle Lake reveals the ancient practice of one-legged rowing, perfected over centuries this is one of the many unique Myanmar traditions you’ll come across during your time in this striking land. Transfer to the airport and fly to Bagan. On arrival, enjoy a local lunch before visiting the most iconic sight of this intriguing region, the Ananda Temple. Afterwards transfer to the luxurious Scenic Aura. After disembarkation, admire the intricate artistry of Shwenandaw, a beautiful wooden monastery covered internally in gold leaf. Equally impressive are the sights at Kuthodaw Pagoda, home to the ‘World’s Largest Book’. Later walk through the rebuilt Mandalay Palace, destroyed during World War II. As the sun sets, head to the top of Mandalay Hill to enjoy magnificent views before your farewell dinner and an overnight stay. Fly to Heho and drive to Nyaung Shwe. After lunch in town, glide across the waters of Inle Lake in private long tail boats towards your award winning resort for a three night Special Stay. Cruise to Inle Lake’s floating market, which moves location every five days. Then, visit Phuang Daw Oo Pagoda, one of the region’s holiest sites. Learn about life at home on the lake with a visit to a local Intha family where your host will cook and demonstrate to you on how to prepare your traditional lunch. Later visit the Pa-Oh village of Indein. Visit Pindaya Caves and try cooking local cuisine, or visit Taunggyi for lunch at Myanmar’s oldest winery. Alternatively, walk to a nearby village and spend time interacting with the locals. Enjoy evening drinks and share today’s tales of exploration whilst overlooking the stunning lake. Fly to Yangon for lunch at the historical House of Memories Restaurant, once the office of General Aung San. Check into your hotel for your last night and savour your farewell dinner at the beautiful Le Planteur Restaurant.